Tattoos are becoming increasingly common and prominent in popular culture. While many people who have tattoos are content with a single tattoo, and others regret their tattoos and have them removed, a proportion of people get more and more tattoos, and describe the process of acquiring tattoos as addictive. Although tattoo addiction is not currently a recognized phenomenon in the scholarly literature or the official criteria for addiction, becoming a tattoo collector is well recognized as a deviant process, that has many similarities to other behavioral addictions, and even substance addictions. 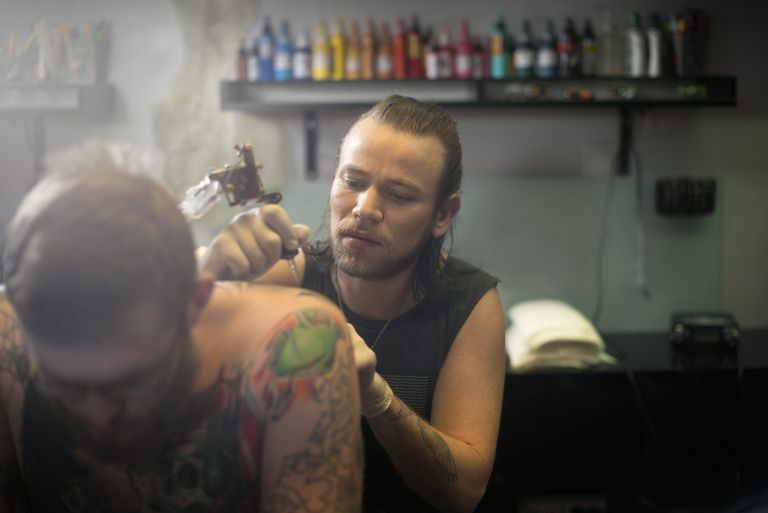 People who collect tattoos are often motivated by similar social factors to those of people in other addiction sub-cultures, such as the desire to be part of a distinctive subculture. In addition, elite groups have been identified within the tattoo sub-culture -- tattoo collectors and tattooists. Both of these elite groups use both positive and negative deviant attributes to maintain a privileged status on the fringe of society, in a similar way to the privileged status that drug dealers and polydrug users do within drug sub-cultures. Just as experimentation with a drug does not automatically lead to habitual or addictive drug use, having one tattoo does not automatically lead to having multiple tattoos, or becoming a tattoo collector. The process that individuals go through, as they transition between "wearing" tattoos and becoming a collector, involves a shift in identity, in which the person identifies themselves as "tattooed" rather than "wearing" tattoos. This shift differentiates the "serious" tattoo collector from the mainstream, trendy tattoo wearer, who is at the bottom of the tattoo hierarchy, in a similar way to the occasional or recreational drug user is in the world of substance use. Researchers who have explored the views and experiences of tattoo collectors have found that some groups welcome the increasing prevalence of tattoos in popular culture, as they become less affected by stigma, others resent the popularization of tattoos. They feel that the specialness and difference from those around them that tattoos provide them is diluted by the whims of fashion. These tattooed people actually look forward to tattoos becoming unfashionable. Tattoo for fashion, rather than entry into a sub-culture of tattooed people, threatens the deviant identity of these tattooed individuals. The shift to identifying one's self as a collector has been termed "affinity," but affinity alone does not lead to becoming a tattoo collector -- a further process known as "affiliation" is also required. Theorists explain that tattoo collectors go through this process of affiliation, or learning to become a tattoo collector, primarily through contact with other tattoo collectors, who teach them what feels good about being tattooed, where to be tattooed, how to decide on what images to have tattooed, and so on. The final stage of the process of becoming a tattoo collector, known as "signification," involves internalizing the tattooed identity, and attempting to make it work for them personally. At this point, they may be dealing with opposing pressures to both appear acceptable in the non-tattooed world, and filling in what they see on their bodies as "blank spaces that need to be filled," seeing these gaps of untattooed skin as indicative of an unfinished job. Guéguen N. Tattoos, piercings, and alcohol consumption. Alcoholism: Clinical and Experimental Research. July 2012;36(7):1253-1256. Irwin K. Saints and sinners: Elite tattoo collectors and tattooists as positive and negative deviants. Sociological Spectrum. January 2003;23(1):27. Johnson F. Tattooing: Ming, body and spirit. The inner essence of the art. Sociological Viewpoints. 2007;23:45-61. Strohecker D. The popularization of tattooing: Subcultural resistance and reflections from 'elite' tattooers. Conference Papers -- American Sociological Association Annual Meeting 2011; 551. Vail D. Tattoos are like potato chips ... you can't have just one: The process of becoming and being a collector. Deviant Behavior. July 1999;20(3):253-273.